The Shiv Sena Thursday attacked senior ally BJP over the Ayodhya issue, saying the construction of Ram temple at the disputed site has become another 'jumla' (rhetoric) for the party and it would lead to their ouster from power. The party said the BJP has not woken up despite its recent electoral defeats in three states and is not ready to learn from what RSS sarsanghchalak Mohan Bhagwat has to say in the context of teachings of the Bhagavad Gita (the Hindu scripture). There is pressure within the BJP to construct the Ram temple in Ayodhya, but when will "achhe din" (good days) come for Lord Ram, the Sena asked. "Shree (Mohan) Bhagwat, while citing the Bhagavad Gita says what is the use of the arrogance (by saying) what 'I' do is the best. 'I' did this. 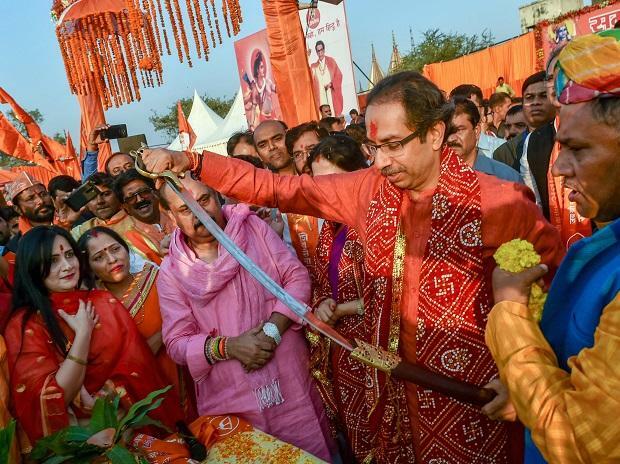 He has given a guiding principle for the BJP," the Uddhav Thackeray-led party said. "But what is the use? This government, like Kumbhakarna (the demon king Ravana's brother known for sleeping for months at a stretch), is not ready to wake up even after humiliating defeats in three states," the Sena said in an editorial in party mouthpiece 'Saamana'. The BJP recently lost power to the Congress in the three electorally important states of Rajasthan, Madhya Pradesh and Chhattisgarh. The Sena said the whole country wanted the temple to be built and that was the reason it voted for the BJP in 2014. "However, as the issue too became another 'jumla' for the party, its journey for 'wapsi' (ouster from power) has begun," the party said. "When will achhe din come for Lord Ram, who is living in an open tent for the last 25 years while those in power are warming their seats," it said in sarcastic remarks. However, on Wednesday, speaking at an event organised by the Republic TV, BJP Chief Amit Shah said "If the Supreme Court conducts daily hearings of the Babri demolition case, it will not take more than 10 days to get a verdict." "Ayodhya is a title issue. The BJP clearly states that we want to build a temple on the same site. The case was pending before the SC much before 2014. We have requested the court to clear the case and complete its hearings at the earliest," Shah had said. The Sena claimed there was a lot of pressure within the BJP to construct the Ram temple. Questions over its construction are being raised in every meeting of the party but its high command has "no answers". "Internally, the party has become restless as the rulers do not have a proper plan," the Marathi daily claimed. The Sena, an ally of the BJP at the Centre and in Maharashtra, also demanded that cases against those who demolished the Babri mosque be withdrawn. "Leave aside bringing an ordinance for Ram temple. You have not even taken back cases against those who demolished the Babri Masjid. Now that the presidential elections are long over and Lal Krishna Advani isn't going to be the president, dissolve the Babri court," the Sena demanded. Advani was widely tipped as a front-runner for the post of President in July 2017 before a Supreme Court ruling in April that year on the Babri Masjid demolition case effectively ruled him out of the race. On April 19, 2017, the Supreme Court had said BJP stalwarts Advani, M M Joshi and Uma Bharti would be prosecuted for serious offence of criminal conspiracy in the politically-sensitive 1992 Babri Masjid demolition case and had ordered day-to-day hearing and trial concluded in two years.